James is a very avid reader and I am always looking for good books to fill his reading needs. When YWAM Publishing offered me one of their history books for free in exchange for a review on this blog I thought it would be a wonderful way to offer James more good books to read. A Christian publishing company, YWAM publishing offers many types of books to fill your needs including science curriculum, fiction and non-fiction novels, audio books, and even some Christian music. I received the Kindle version of Heroes of History: George Washington. I was cautious about accepting this offer because I didn't want anything too 'over-the-top Christian.' My readers may remember how I feel about these types of items from previous blog posts. Well, my worries were unfounded this time. This historical narrative is intended for ages 10 and older and really makes the reader feel they are with George Washington as he rises to success and power. The story is about more than just the first president. It combines many aspects of language arts learning in addition to history, geography, science, and social studies. The book is a longer one but is so engaging that James was able to breeze through it in a matter of days. Christian aspects in the text are present, but they are not burdensome to the reader. 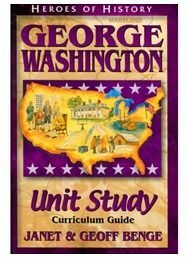 We also received the e-version of Heroes of History: George Washington Unit Study Curriculum Guide. James is already in a formal literature study twice a week and so when I saw that I was also receiving the Unit Study Guide I thought it would be too much to have him complete it as well. I didn't want an overkill on the literature study. I am so glad that I decided to take a look at the Study Guide before I told him he didn't have to do it. It is amazing! The book was great and was definitely a fun read. But the Unit Study is where the real goods are at! I almost want to read more Heroes of History just so I can have access to more of these guides. The guide comes in two parts and contains over 50 pages of learning objectives. Even before I read the book I was engaged in the planning for using the guide. Literature Study is not my strong subject, and frankly I kind of shy away from the book group I have to lead three times a year. This guide literally spells it out for you. You are not just sitting around chatting about the book. In addition to comprehension questions and discussion you are actually creating a visual representation of the book to display (if you want) in your classroom. James is really into collecting things, but we didn't have anything related to Washington D.C. or the Revolutionary War, so we printed the quote (Part 1 of the guide) and printed up some images off the internet to hang above his desk. And we used a real dollar bill because miraculously we had one of those around the house. It was a nice way to relate the book to things in our every day world. James and I skipped the chapter questions because, as I stated above, he is already doing a literature study class. But if he wasn't in that class these questions would have been a godsend for me. They are organized by chapter, and really encourage the reader to think about the "why's" and "how's" of the story. Much better than the comprehension questions I would have been able to think up on my own. I really like when the questions force the kids out of their comfort zone. Instead of asking for specifics, the questions ask the reader to digest the information and relate different parts of the story to each other. Another part of the guide offered over 25 ways for the student to further their learning through writing and projects. Some of the activities that appealed to James were writing a poem and creating a movie about George Washington (both of which I think we will save for when we get to the Revolutionary War in our history studies). Overall I thought the book was definitely worth it for my overactive reader. I just wish it had tied into our current history studies so we would have had more time to really dissect the study guide and the activities it contains. We will definitely be rereading this George Washington book when we get to Early American history. Although I have a lot of books I have to read right now, I enjoyed reading this book and it didn't seem like a book I had to read at all. It was like a book I chose at the library. 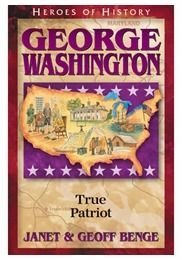 George Washington: True Patriot and George Washington: True Patriot Study Guide are both available on the YWAM Publishing Website for $6.99 and $7.49 respectively for the physical copies. Different version of the product have different prices and I encourage you to visit the website to view your purchasing options. Other reviewers over at The Schoolhouse Review Crew took a look at the George Washington book or a book about Jim Elliot. Click here to check out those reviews, or click the banner below.